Turns lead or solder to the same dark color that occurs naturally over time. Premixed and ready to use. 8 oz. bottle. 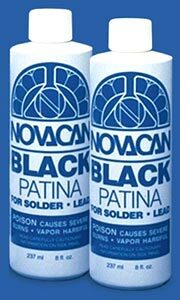 Novacan Super Brite Copper Patina 8oz. A specially formulated copper patina for solder. It’s premixed – just brush it on for a bright copper finish. 8 ounces. 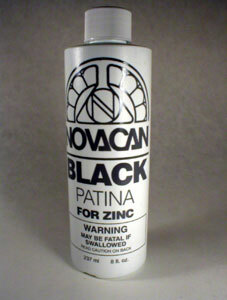 Finish your zinc projects to a lovely black color. Premixed and ready to use; 8 ounce bottle.